Posted on Mon, Mar 26, 2012 : 8:33 a.m.
A window on the sixth floor of North Case Hall at MSU is boarded up Sunday afternoon after 18-year-old Ann Arbor Lexi Pew fell from it during the early morning hours. An 18-year-old senior at Greenhills High School in Ann Arbor was hospitalized after a six-story fall from a Michigan State University dormitory early Sunday, television station WILX reports. Lexi Pew suffered broken bones and a collapsed lung, a family member told the TV station. Pew tripped during a game of catch and fell through a window, shattering the glass, the station reported. John Foren, communications and media relations manager at Sparrow Hospital in Lansing, said Pew was listed in critical condition Monday morning. He said he could provide no information about her injuries. The State News, MSU's student newspaper, reported a student saw broken glass and then saw Pew lying on the ground after the accident at North Case Hall. MSU Police, in a message posted on their website, said they are investigating and have found no indications of suspicious activity. Tue, Mar 27, 2012 : 2:33 a.m. Colleges should all take a look at the windows in their upper floor dorm. While this accident wasn't as tragic as it could have been windows in college dorm rooms should be student proof. It is our responsibility as adults to protect our young people. Mon, Mar 26, 2012 : 4:01 p.m.
MSU needs to replace all those windows. 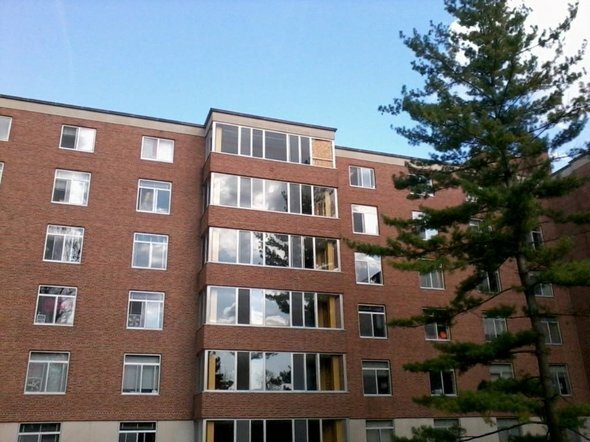 Michigan lost a student who tragically slipped out of a dorm windows many years ago. A tragic accident - but one that could have been prevented if only the windows hadn't been so old. Thankfully the UM took action and replaced each window with safer and more modern windows. I imagine MSU will now do the same. I'm sending good thoughts that this young woman has a speedy recovery. Mon, Mar 26, 2012 : 7:56 p.m.
UM only took action after it was sued. Considering how litigious society is these days, expect a similar lawsuit in this circumstance. Mon, Mar 26, 2012 : 2:31 p.m.
WOW...now that's fuel for a lifetime of nightmares!! Poor girl, I hope she's good as new soon!! Mon, Mar 26, 2012 : 12:43 p.m.
After reading the full story, it's obvious she is one lucky young lady!! Best wishes for a speedy recovery!! Mon, Mar 26, 2012 : 12:42 p.m.
prayers for a full recovery. Surviving a fall from 6 stories is pretty amazing.